Complete Guide of Domain Authority – How to Improve It? Want to know how to increase domain authority of your blog or website? Here is a complete guide to improving DA. Every serious blogger wants to increase his blog domain authority. Since we all know Website’s overall link authority strongly correlates with higher search engine ranking. And who don’t want higher search engine ranking? Increasing Domain Authority (DA) is not like making a cup of tea. You need to do lots of hard work and keep patience. DA is most important factor in Search Engine Optimization and to know how quickly you can beat your competitor. Having a high DA is to reserve good position in SERP and get massive traffic to website. You have seen many times some websites are ranking better than yours for most of terms and queries. But when you checked their content, it was not detailed as yours. Surprised how they are ranking? There is some magic behind their website ranking, Off course, Yes it is the magic of higher domain authority. Google gives importance to high authority websites or blogs. Domain authority do not only help in getting higher ranking and traffic, but also helps in getting offers of advertising, guest posts and sponsored reviews. Having a high Domain Authority is a win-win deal. Is your blog’s domain authority high? Don’t worry.. Today I am here to tell you how to increase domain authority. There are several times already talked about improving domain authority. But I believe to share all information at Updateland to my readers. Read complete guide and follow all steps if you really want to increase domain authority of your blog. Domain Authority is a signal that helps to know the power of a domain name and how well a site performs in search engine results pages. Or we can say that Domain Authority is a rating of website like Alexa rank or page rank. It is short termed as DA. It is developed by MOZ. We can say.. DA helps to know how easily or hardly we can rank for a particular query in Google. In simple words, Domain Authority shows how much Google trust your website. A website having high DA like 85, 90, 100 rank at no. 1 position as seen in below image. There are many major and minor factors behind domain authority calculation. It is based on root domains backlinks, number of total links, Moz Rank, Moz trust, age and popularity of the domain, Search Engine Result Pages and amount of content on your website etc. Root Domains Links: Root domains (ex: www.updateland.com) links means backlinks which are pointing to your root domains. If you make thousands of link from a single website, it is not going to help you. Create high-quality backlinks from unique domains which points back to your website root domains. Moz Rank: Moz Rank shows a link popularity score or how a link popular on internet. A web page’s Moz Rank depend on the number and quality of the pages that link to them. Higher quality backlinks is a sign of higher Moz Rank. Moz Trust: MozTrust is Moz’s global link trust score. It is similar to Moz. But it focus on link’s trust rather than popularity. To get higher Moz Trust, you can get links from homepage of university website or government pages. Domain Age and Popularity: I think Domain age don’t need any explanation. Right? Domain popularity is another most important factor behind domain authority. It is the comparison of total inbound and outbound links to your website and how your website is performing on Social Media. More inbounds links, shares and likes indicate your website is more popular. Amount of Content: You can’t create huge number of quality backlinks in single day to increase domain authority but off course, you can write 4 -5 high-quality articles and get publish at your website daily. Putting regularly fresh and unique content is helpful to increase domain authority. The better you write, more people like share and link to your content. I use Grammarly to write error free articles, you can do same to increase domain authority of your blog. People don’t love to read poor content. They come and leave after reading two three lines. Off course, you don’t want people came and went in minutes, so write depth guide like this how to increase domain authority guide. Domain Authority depends on domain age, backlinks and website content. You can’t increase domain age. It is not in you hand but you can put some unique and fresh content at your site and build quality backlinks. Quality Backlinks means backlinks that come from high authority sites. Backlinks helps to increase domain authority and to deliver targeted traffic to your site. It also helps in search engine visibility. You can’t ignore social media it has great impact to increase domain authority. Yes, On Page SEO has own role to increase domain authority. Don’t be fancy to optimize URL structure, robots.txt, meta titles and image alt tag etc. Without optimizing these features well, your website wouldn’t have best SEO so make sure you are following best SEO Practice. As Moz explains, to increase domain authority, you need to work out at overall SEO including site structure, navigability, breadcrumbs, URL structure, meta tags, header tags, word count, alt tags, keywords, etc. Ensure your website has user-friendly structure, Some people fill your website with their add just to earn some bucks and they lose their audience. After some time, they notice, their site has been dead. No one is coming to read anything. Then they realize what they have loosed to earn few bucks. Before you start workout to increase domain authority of your blog, make sure Your SEO is best. To increase domain authority, you need lots of quality links points back to your root domain. So if your website has not higher DA, focus on creating high-quality links for root domain as compared to blog posts. Getting lots of links from one website is not going to help you to increase Domain authority. You need to gain huge backlinks from unique domains to increase domain authority. There are several ways to create high-quality backlinks for the website, which will be proved very important to increase domain authority. You have heard several times Guest Posting is dead. But this is still the most effective off-page SEO techniques to creating backlinks and establishing a relationship with influencers in your industry. Go with epic and helpful content and do for this establish relationship not for getting backlinks. If you create 500 – 600 words content for guest posting and stuff with keywords, it is not going to help you to increase domain authority even it can harm you. You can easily search blogs that accept guest posting in your industry by following foot prints. Replace keyword with your niche and keywords. Ex- You want to search beauty blogs, then replace Keyword option with your niche keywords like Beauty + intitle:“contribute to”. Guest posting can be proved very good way to increase domain authority if you do in right way. 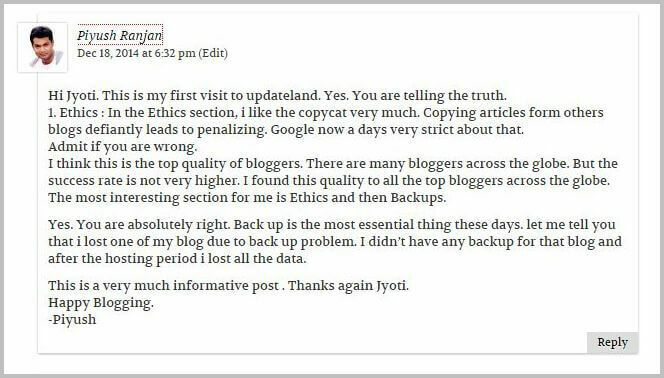 Blog Commenting is also one of my favorite technique to get quality backlinks and maintain relationships with top bloggers in my industry. You can do same by adding value to their post through blog comments. Everyone love to see comments at their blog. Show love by commenting. Avoid one line comments. Having 10 blog commenting backlinks which add to value (seen in below image) to an article is better than 100 one line comment. Here is a blog commenting sites list with high DA and PA.
Social Bookmarking is another great way to get backlinks and traffic to your website. It helps to promote content and reach tp global audience which turn into global traffic. So it is a win – win deal getting backlinks and global traffic. 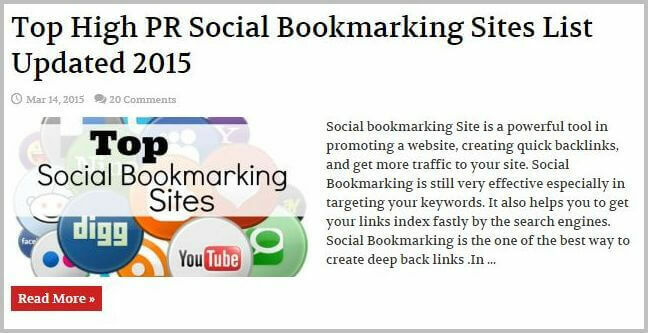 Here are some social bookmarking sites to submit bookmarks. I have written a post that include social bookmarking guidelines, procedure and top social bookmarking sites.I know you don’t want to Google. Take a look at social bookmarking sites and guidelines. Some people things directory submission don’t work now a days. But it is not true. There are several users who still use directory sites to search specific websites or blogs. Getting backlink from directory like alltop and dmoz, you think don’t work? Hmm it plays an important role in search engine optimization. But getting a backlinks from top directory sites is very hard. Here are some best directory sites to consider directory submission. Want to submit to more directory websites? Here is best directory submission list. Forums are great source to establish connection with experts and learn from experts. To create backlinks from Forums, first you need to search forum into your niche. As you find forums, create account and complete your profile, start participating in discussion. You can ask questions according to your niche and reply of other questions if you have knowledge. Every forum has own guidelines. Some forums allow to post links in reply while some not. Some only allow links in signature option after certain number of posting in forums. Some forums have very high DA, you can increase domain authority of your blog using such type forums. If you are blogger or webmaster, you definitely heard the word Infographics. Infographics are great source to get lots of several high quality backlinks. Are your surprise how? While only few Infographics sites allow free submission. Everybody love to use beautiful and informative infogrpahics. First you need to create unique and informative infographics. Then search best blogs in your niche and reach out to bloggers and offer them Infographics as a guest post. They will happy to publish your guest post. In this way, you can get 50+ high quality backlinks easily. If you are serious to increase domain authority of your website, take advantage of this awesome link building strategy. In this way, you will not only get links but also build connection with bloggers in your niche, how cool! Make sure you have clean link profile. Many people do profile link building using forums sites and some times, they create threads to post their content to get backlinks. In this case, due to self promotion, mostly forum flagged your profile with the spammer label. So if you ever done such type activity, delete that profile or update profile URL which point back to your website. And check your webmaster to make sure, your incoming links are good. If your blog have low quality backlinks, get rid from all of them to rank you website and increase MOZ trust score. You can use Majestic to check your trust flow. If your website trust follow is more than half of citation flow, your are doing good. If it is not, you are on risk. Anchor text and citation follow both are important factor to make sure clean link profile. To do safe link building, use your name or your domain name variations like Update Land, UpdateLand, Updateland.com and Jyoti Chauhan. If you do natural link building, Google will never hurt you. So make sure you use your name and domain variation as anchor text. Yes, content play an important role to increase domain authority. Content is something what in your hand and it has great role in gaining higher domain authority. Content is backbone of most successful authorty websites, you can simply look any popular websites in your niche, they have Epic Content or Ultimate Guide. User can learn all things from them. In Internet Marketing niche, you can see backlinko.com, quciksprout.com, shoutmeloud.com and many others. They all are best known websites in marketing niche. If you give a look to their content, you will found every post is guide in themselves. When you create Epic content, people love to link you in their article. You can create lots of amazing content to your audience. Produce very detailed content on a topic (like this what you are reading)and try to come with totally unique. If you are not expert in creating high quality content, you can shoot out a mail to top influencers into your industry regarding to share their view at specific topic and tell them, this will be an Epic guide of 2000 – 3000 word of a particular topic. I am sure they can’t say no to you. Everyone love to featured and be popular. To find what is popular currently in you industry, you can use Buzzsumo. It is my all time favorite tool to find popular content in my industry. Build Strong internet linking helps all user, search engine and website owner. A use get all related information what he want at one place and website owner get traffic from one article to several another one if he did strong internal linking. Search engine easily go with relevant page. Strong intern linking means he offered to use when he need. if you describe social media in the first paragraph and link social media article in last paragraph why user will check your article. Having a website with lots of more content can help in building more internal linking, more inter-linking is more traffic. Here are some essentials to keep in mind while inter linking. 1. Use different variations of anchor text like how to increase domain authority, increase domain authority, domain authority etc. I hope you have got my point. Using exact anchor text every time, may be harm you result drop in DA. 2. Offer when a user need. 3. Build a specific no. of links within an article. Interlinking many posts into single article can be result in overload. Read What Matt Says How many links per page? If you want to increase domain authority, you need to market your content. Content marketing is most important thing which can help you to earn more trust and more sales also. After creating Epic content, now time is to reach out to the audience. No source is better than Social Media to promote your content. Everyone is hanging on Social Media. Social Media has great impact on building a brand and drive massive traffic. For a new blog to gain search engine trust is not an easy job but creating high-quality articles, you can easily gain trust to your audience and people into your industry. If you have published expert roundup post, shoot out a mail to all experts and tell them you have published articles. They all will happy to comment at your blog and even will like to share with their audience. We all know Social Media is very time-consuming but we can’t ignore social media due to its importance. I use Hootsuite to save my time. It helps me to share my post in multiple groups by a single click. Get your Free Hootsuite Pro 30 Day trial, visit Hootsuite.com. Using Hootsuite doesn’t mean login into social networks. You need to connect personally with your audience to become successful. People who connect with us personally, they like to share our content and interested in our services. If you don’t login, how can you cash those opportunities which are coming into your social network message box? If you are doing exactly what I have explained above, surely your website domain authority will rise. As I already told you domain age is also an involved factor behind DA. I tested site having more domain age having higher DA. But it doesn’t mean domain age automatically increase domain authority of your blog. If you follow all steps which I described above property, as time will grow, your DA will shine. Due to lack of any essential of improving Domain Authority like Fresh content, Proper SEO, clean link profile, lots of natural links from unique domains, you can lose Your DA. Grow to take with together. To increase domain authority of your website, you need to track timely and to know how your work is going to help you to increase domain authority. If your domain authority is not increasing, you are doing wrong and you need to implement your strategy again. If you are seeing an increasement in your domain authority, you are doing great. Congrats 🙂 Keep doing. There are several domain authority checker tools available online. I have selected 5 best domain authority checker tools tested by myself to make your work easy. You can easily check your blog’s domain authority by entering your blog URL. 1) OSE: Open Site Explorer(OSE) is my favorite tool to check domain authority and for other tasks. I always use this. It is very user-friendly. You need to put your website URL and click on search button as seen in below image. All done. You will see complete metrics including domain authority, page authority, just discovered backlinks, established links and page social metrics. Page social metrics is only available for MOZ Pro subscriber. 2) SmallSeoTools: SmallSeoTools is another good domain authority checker tool. You need only put your website URL and click on Check Button. All done. It shows exact domain authority, page authority, linking root domains, total links and status. It is one of my favourite platform since it offers many useful free SEO tools to do many tasks. You can check up to 10 domains authority at one time using SmallSeoTools. 3)MozBar: It is one of my favorite toolbar, if you are currently not using this toolbar. I am sure you are going to love this. Using this toolbar, you can check domain authority of any website which you browse … only with a single click… at Moz bar symbol. And even all those website who are coming at top when you are searching in search engines. 4) BulkDaChecker: BulkDaChecker is good domain authority checker tools for those who want to check mulitple domain authority in single go. You can check upto 200 domain authority in single go. Best feature of this domain authority checker tool what I like is downloading CSV files of records and checks. This feature helps me to save more time. 5) SeoWeather: SeoWhether is another best domain authority checker tool. There is no limit you can check upto hundreds of thousands domains’ domain authority by single click. It shows DA, PA, PR and IP Address. It also offer feature of downloading CSV files. So you don’t need to waste time to note one by one. Only click on Export to Excel option, it shows at bottom of table and all done. If you found this complete guide of domain authority useful, please share with your friends and followers and share your own views about domain authority in comment section. I would like to hear from you also. What method do you use to increase domain authority of your website? The post is useful and worthy of share. The meaning of Domain Authority (DA) eludes many people. They readily never get to understand what it is and how it could be relevant to their site’s success. Its a good thing we now understand what this means and how to increase it. More so, thankfully, there are tools like the Open Site Explorer that helps us search for DA with just a click of the button. Thanks for stopping by and dropping comment at UpdateLand. Nice to see you again 🙂 It happens with everyone when s/he start blogging. We all need to learn lots of things to get best results. I happy you found this post useful for yourself. Thanks for sharing such a great guide. As we all know google stopped to update its page rank so DA/PA is getting more popularity and it become the first choice to measure the site performance. Quality link building will help a lot in getting higher Domain Authority. Very true, Google has been stopped to update page rank that’s why we all need to focus to get higher domain authority. By creating unique content and quality backlinks, we can good Domain authority. I am glad you found it great. Well done job Jyoti !! You shared a detailed guide to increase Domain Authority. All points are well explained and hitting the exact goal. Happy to read your specific and complete Guide of Domain Authority. Keep writting !! I am happy you enjoyed this. Awesome blog post miss jyoti, You blog updateland always inspire me to know more about internet marketing and also helpful in knowing more concepts of making some reputation of our websites. Awesome post on increasing domain authority. Domain authority is very important for blog because it is about you blog. if you blog authority is high that’s means you have authority blog and very trusted blog. Very true Vishal, Domain authority is very important since it helps us to know how will our site perform against competitor sites. Well now a days all the advertiser or clients are preferring the domains with high DA and I guess its has become a crucial part of every bloggers to improve their DA. I read the whole article, and also chekced my site for da , but I am not sure- if other people are using your sire to linking how you can make sure if you have backlinks from good sites only. i also notice in my ga that many sites linking to me witohut my permission and those sites are not good..
You can USE Open Site Explorer and Webmaster to see whom are linking to you. if anybody are linking your website without permission and his website is low qulity. Drop them a mail and tell her/his to remove your link. You don’t want links from low-quality sites. Coming to the post. You have some sound tips to share to increase the domain authority. Blog commenting works the best for me. Thanks for sharing some of the online tools/services to check domain authority. It will surely be helpful for all. Glad to connect with you on LinkedIn. Thanks for the tips. And have a great weekend. Well i would like to say you did very good job through this DA concept and now every one clear that what is DA and how to get improved own website DA. Thanks for this lovely post and i would definitely share with my other seo or internet marketing friends to read this informative post. Glad to see one of my comment listed here. Thank you so much. Well, currently m domain authority is 10 (three months old blog). I don’t know this is good or bad. But all i want to share here is that blog commenting give me a lot of freedom to interact with the bloggers and sometimes get mention like you did. This is a really helpful guide for me. Every topic seems very much important for me. Hi Jyoti, Thanks for the other great content. All points are really important and some of new for me. Very elaborate post on Domain authority. Now a days, it is a great matter of concern for the bloggers to build up links only on authoritative domains and for this they should know how to calculate the domain authority. You have mentioned really cool ways of how can we bloggers can calculate the domain authority? Thanks for the post Jyoti. So glad to see your post on how to increase domain authority. Domain Authority is Moz’s calculated metric for how well a given domain is likely to rank in Google’s search results. It is based off data from the Mozscape web index. You describe here clearly how to increase domain authority. Many thanks for your great tips to increase DA. Once again you come up with an excellent topic which is about how to increase domain authority. I am also using opensiteexplorer for the same purpose. Infact this post is very useful for every blogger. Thanks for sharing nice guidelines. It is good to see you again with an excellent guide on Domain authority. I was thinking the same that Directory submission is not working now. However, I am sure that It matters yet by reading this article. By the way, the new these is looking very cool. Jyoti Apu you are a complete guideline for me. When I was talking with one of my friend about SEO and the terms, he mentioned your website. Therefore, I start reading SEO tips section for my website. I need to know how to deal with the options and generate traffic. Before reading the article, I heard about DA but never get complete detail and increasing ways. Now, I know how to deal with the term and increase the profit by increasing the DA of my site. Thanks for your guideline writing for us! Really a great post on Domain Authority. It cleared all my doubts. Do you really think that Domain authority is still the sign of a authoritative blog. I am saying this because I have seen so much domains having high DA but when I checked the quality of their Backlinks then I found that the link profile is low quality. Nowadays one can easily increase their domain authority by creating Spam links too. So I had stopped focusing on domain authority. LIS score is still better thing to consider when identifying the quality of any blog. i’m willing to develop my blog DA and on the proper time you could have published this article. quite this is a ultimate article for me to gain knowledge of all of the major explanations about DA and PA. obviously i am going to work on this. Very nice article and it helped me to understand DA. When I check the back-links in Google Webmaster tools it shows 5,518 links and 619 domain names. But in DA Page Link Metrics shows 8 Root Domains and 108 Total Links. So DA rank is very less to my site. Any suggestion please. Nofollow links are also helpful to increase DA. Time depends on numbers of links you created every day. Domain authority updates mostly once in a month sometimes it takes more than one month. The information you are providing is very helpful for me and other curious readers also.I have just one question in how many days does the DA changes ? Welcome to UpdateLand, I am happy you found useful for yourself. Mostly DA updates after one month. It is not exact time duration but it updates almost after 30 – 40 days. Kepp visiting to learn more information. Very informative. I agree with all of your points! As the page rank is Gone, SO domain authority becomes the main source to check the reputation of any website. We must take about it. And you have also shared some amazing tips and tricks about increasing domain authority. Thanks for the complete guide. Buy I am not finding ti easy as I am not able to know, why I am not improving. Every time I heard about PA/DA, I found these confusing. But you have nicely explained the concept. I checked my DA and found the ranking to be 19 so I need to work a lot. A blogger’s job is not an easy one but with informative guide such as this the journey becomes easier. Thanks a lot for this very informative post-Jyoti. Recently I lost 4 ranks from 22 to 18 in Domain Authority and to be frank I don’t know what exactly it is and how we can get a good DA as of now. This post has given me some boosting in my confidence to make some improvements on my DA now. Once again thank u so much. First of all, thanks for sharing such a useful article about domain authority. As a blogger, I’m still working on increasing the same. As you’ve mentioned above that forum submission and answering gives quality backlinks, some best forums are shoutmeloud, digital trends & Reddit is also very useful for getting quality backlinks. Great article. Thank you so much for the detailed . “increase domain authority Ideas” After reading your I conclude on blogger as being a newbie. Reddit is also very useful I am also regular visitor of your website and bookmarked it. Thanks for this awesome post. I know how difficult it is to grow your Domain Authority especially if you new to the Blogging fraternity. Your post will definitely help people grow their Domain Authority faster. However, I have a small query. What do you think is more accurate matrix for measuring Website Trust? Moz Trust or Majestic Trust flow? Very useful information. I love reading your articles. Every time you come with a strong topic. Thanks for sharing this valuable info. Surly I will implement on my blog. Nice write up. I created a video here: youtu.be/aj91qOjA04w that explains the process I used to manipulate PA and DA for 2 different websites. Increase domain rights is one of the key factors in photosynthesis Seo . Thanks for the article because it has helped me understand a lot more . Domain age is important ranking factor. My site is 6 months old and has domain authority 20 but still at 5 page of google. My competitors has low domain authority but has domain age 1 year old and it’s ranking very good in google. I have seen top 2 pages of google after searching domain authority keywords and I noticed that the presentation style of your blog is just wow! 2) Images and paragraph are very clear. Based on your post I an surely say that you have expertise in digital marketing. I have started a new blog and currently it shows DA of 1, What you think how long it will take to show 10 DA, How much links I have to provide in 1 month, 2 month? This is amazing guide to increase DA of your website. Very useful information! Hey, great article, just one question. Is it ok to judge the blog performance by their domain authority? So, if the domain authority is high, will the traffic will also be high? Loved all the tips and the linked resource pages. Thanks for sharing. Take care and have a great day ???? And finally today I query got a full stop about algorithm behind Mix Domain Authority. Well explained Jyoti. the Domain Authority is a very inaccurate value (I use more SEO tools: Moz, Ahrefs, Majestic, etc.). – But Google had more than 30 trillion(!) urls in just 2013. And if you want, you can block these linkcheckers in robots.txt or with .htaccess. I think, there is no real alternative to PageRank. Tell us how to increase PA(page Authority) too ? as your PA is greater than DA how ? Please write about PA too. Hi, Thank you for making this post. I was able to find the informations i need to get a better knowledge. I will come by to read more information regarding to SEO, PA, DA and other marketing knowledge. Please keep me in the loop. Thank you for your time reading my comments. Really awesome post! really needed such kind of website where I can find the ways to increase the DA of my website..I would say SBM and listings works a lot for me. I think one must share it’s website’s link on a high PR site. That what I can say till now since it has worked for me. Thanks for sharing such valuable information with us. Keep posting as I’m expecting more valuable information such as your present post from your website in future. I came to your post by searching on google to how to increase the DA of any website. And i must say you cover up all the points here. highly appreciable. one question i have, my DA is increasing but PR is not. will you help me how to increase PR of any blog?? Thanks for your this complete guideline.Awesome post on increasing domain authority. Quality link building will help a lot in getting higher Domain Authority. I couldn’t find good article on this. Some great tips there. Surely gonna help many a lot. Again, thanks for great post!! In fact you are one of the best blogger as well excellent in SEO area. I am not appreciating you this is actual thinking ,i say you again you are doing well. I think in reading of your blog your strategy of explanation is more attractive, in your blog i think every word is very useful. Really you are one of the best blogger as well the link provided by you is 100+10 % working. I can not explain about you but in simple word you are best, super star, standard, top ,attractive ,intelligence ,master ,splendid ,work efficient, more useful . Thank you for sharing this type of information. Thanks again for giving me a golden opportunity to write blog. You are absolutely right. Domain Authority is an overall website’s SEO score. To be honest, I think that having high-quality backlinks is the most significant factor that makes a great impact on DA. Thanks a lot Jyoti for sharing this extra fabulous article with us. My blog domain is really having Low Domain Authority. I do write contents that are good than my competitors, but still, I am not at all over ranking them. Now onwards, I am going to follow all your mentioned steps and let me see How I can increase my Domain Authority. Again Thanks for sharing this guide. i thanked you to solve my problem about DA and PA. i start my website 3 months ago about gadgets and tech but do to this hard competition some time i think i have to leave this. But a really thanks people like you who helps new bloggers which different kind of information. now with your given information i will try increase my website’s performance. i hope it helps me and i have some question please – is it helpful to comment on other bloggers with your website link ? i mean is it help us to get back links? Don’t put url into comments for backlink purpose, in this way nobody will approve your comment and your comments are also marked spam by plugin. Only put url into website field. And try to add value to the article by your comment. This is excellent information and very helpful to boost website. Thank you so much for providing all these details. Perfect article for me. I am a new blogger in this huge world. I love to read tech related Tips article. 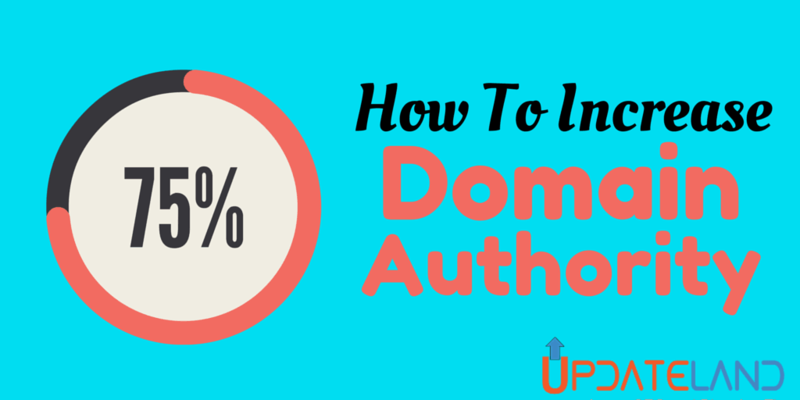 everyone try to increase their Domain authority. first i search it on YT. i found lots of video but on this video, i can not find useful for me. suddenly i see a link and when i click this link i Got my Full answer on this article. I also found Some Do follow Backlink Site From This article. Thanks a Ton. First, thanks to you, for writing such an informative article. I am good at on-page SEO. But, not good in off-page SEO. And, I wasn’t aware of majestic. Will use it to check trust flow. But, why you haven’t mentioned about Ahref?. I am using it since a year, it’s quite a good tool for bloggers.